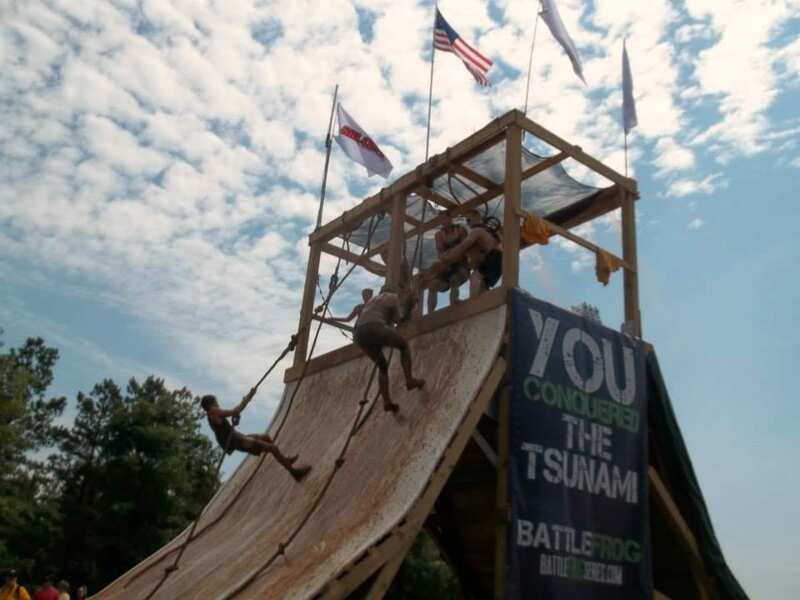 BattleFrog’s second event picked right up where the Atlanta event left off last month. There was no chance of them experiencing a Sophomore Slump in Carolina this Saturday. 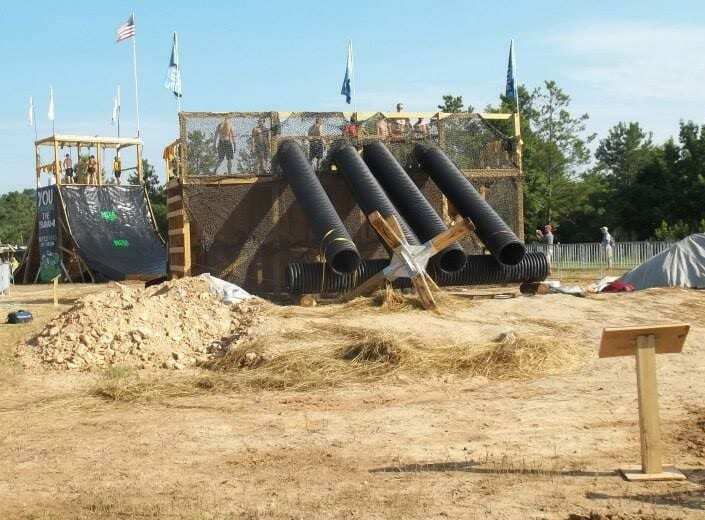 A 15k Obstacle Course Race that is designed by and operated by US Navy Seals, this is a world class OCR that offers Cash Payouts for the 15k Elite Heat Runners, a 5k event, and a 1k Fun Run OCR for children. 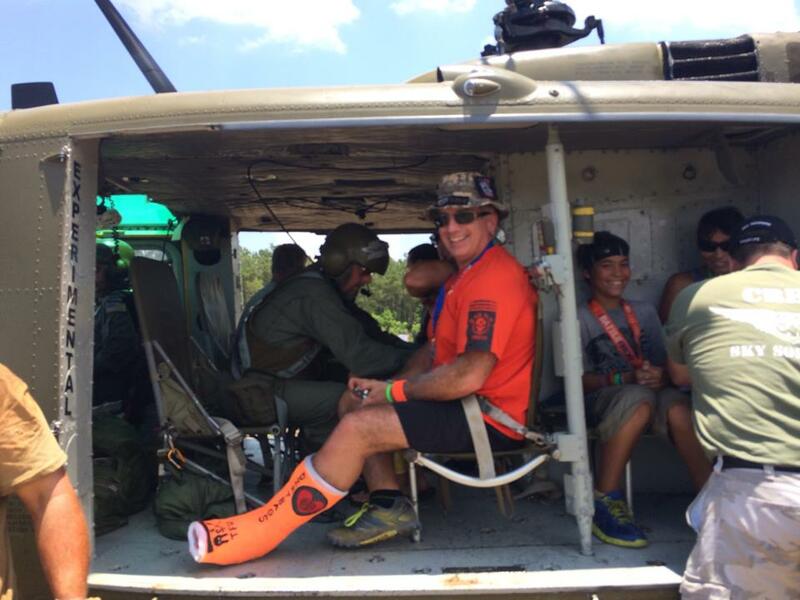 With fitness competitions in the Festival Area, inflatable bouncy play zones, great music blaring from the PA’s, and Seal Team demonstrations throughout the day along with helicopter fly-overs, even when you weren't running you were having fun and staying fully entertained. Saturday’s high temperature promised to be near 100 degrees, so there was an initial communication from the Race that the medical team was going to require that shirts be mandatory for all racers to aid in heat dissipation and prevent sunburns. After hearing feedback from the racers, this was amended to only being that shirts were “recommended”, along with recommending that racers bring hydration packs especially for the 15k event. With the water stations on the course, the many hydration packs among the runners, and proper preparation there were no known instances of heat stroke or problems on the course. It shows a lot about the Race Staff that they heard the responses from the participants and were able to change their requirements accordingly. This doesn't often happen. The Elite Heat stepped off at 0800 under beautiful sunny skies and all the elite men and women 15K and 5k runners started at the same time. Having a Co-ed start with the results separated and organized based upon the timing chips is a refreshing way to start a race. The best running with the best and on the field at the same time really raises everyone’s performance. And I know of more than a few ladies who took particular pride in being able to truly “Chick” their male counterparts. After being whipped into a frenzy by Coach Pain’s motivational speech, the runners took off at the sounds of explosions and fully automatic machine gun fire. Adrenaline rushes through superior firepower. 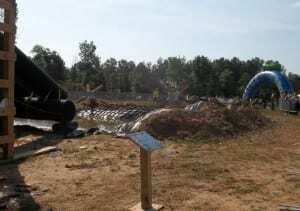 The course was laid out in the same ATV/Motocross venue where other race series have staged successful events in the past. Like Spartan, Superhero Scramble, and others, BattleFrog took full advantage of the challenging nature of this hilly, swampy, and wooded terrain and turned it into one of the more difficult and fun OCR races around. And the natural scenery makes it a beautiful place to be running. The obstacles were all extremely well built and certain ones like the rope traverse actually were longer and more difficult than any similar obstacles have been at other races. The obstacles are dedicated to fallen US Navy Seals and there are placards throughout the race course identifying a lost hero in a way to honor the memory of someone who gave their life for our country. It lends an air of respect to the endeavor of completing an obstacle if you think you’re doing it to commemorate the sacrifice someone made for you. Once again the 5k and the 15k racers ran together for a while, then the longer distance runners split off onto a detour in order to run further. There was an issue with directional signals and the first 7 male runners got off course and actually ran a shorter distance than the other 15k runners. The issue was corrected almost immediately and none of the elite women were misdirected. However, now there were competitors running in 3 “money races”. Since the 7 runners who were misdirected were competing in a shorter race through no fault of their own, BattleFrog took full responsibility and awarded cash prizes to the top 3 male 15k racers, the top 3 female 15k racers, and the top 3 “modified 15k” racers. This cost BattleFrog an additional $1,750.00 immediately because they added these extra prizes, but it speaks volumes about their dedication to honoring their commitments and doing what is right. Any race that will put their money where their mouth is and go to these lengths to address and correct a problem immediately needs to be applauded. There are many races still in existence that have yet to make good on their cash payout issues. BattleFrog writes their winners checks on the spot. Racers consistently raved that this was one of the best OCRs they’d ever run. The only negative feedback I heard was a concern about the lack of a large number of volunteers on the course. The ones who did work, especially the valiant souls who busted their butts helping people at Tsunami, were wonderful and helpful, but BattleFrog ran into some unfortunate circumstances surrounding volunteer registration that can hopefully be addressed in future events. This being only their second event it seems that a lot of folks were reluctant to work this event because they were unsure of how they'd be treated. I have spoken with many friends who worked both Atlanta and SC and BattleFrog treats their people as well as, and in some ways better, than Spartan or Tough Mudder. Great, friendly, and courteous staff. Free racing, discounts at the Merch Tent, and food vouchers so Volunteers eat “real” food from the vendors instead of just a sandwich and a bag of chips. If you’re interested in volunteering to work at a race, this is a good race to work with. The other obstacle was that the Winnsboro area is much less populated than a metropolitan city, so there were less local folks to fill in the volunteer needs especially with College out of session and a lot of people on vacation. The next 4 BattleFrog events are in DC, Jersey, Pittsburgh, and Miami. If interested OCR racers pitch in and get others excited about working, these staffing problems should hopefully go away. 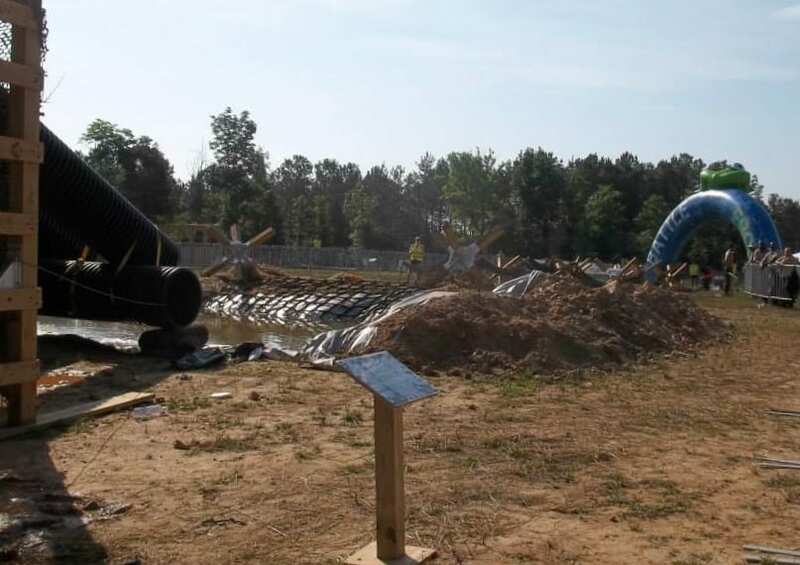 Overall BattleFrog is a remarkable success story because of the level of competence they have been able to show in just their first month as an operating Obstacle Course Race. Participants enjoy themselves from the moment they park their car until they leave the venue at the end of the day. Tired, sore, slightly smelly, and usually wearing a medal and a smile. I wholeheartedly recommend this race for everyone, and be sure to bring your kids and your friends.